to your remembrance, all that I said to you. The breath God breathed into our nostrils is spirit and life, meaning the Spirit is in the breath and the breath is in the Spirit. Breath is everything in the meditation experience. In the higher stages of meditation, breath and breathing become more and more significant. Like the active and passive aspects of the Triune Self, the breath is also active and passive. It is active as breathing and passive as our soul. The active aspect of breathing keeps the Triune Self connected to the nature body, while all of our thoughts and actions in this life are imprinted on the passive aspect referred to in these writings as the breath-form (soul); it would not be incorrect to say that our thoughts and actions are imprinted upon the soul with every breath we take. The soul is not conscious; it resides between nature matter and intelligent light; it is finer than matter, but not as refined as light. This form of matter is referred to as essential matter, meaning that it operates in matter, but it is “super-refined matter” which makes it invisible and indestructible. The only thing that alters essential matter of the soul is conscious and unconscious thoughts which are etched upon it. Our individual soul is a component of our eternal Triune Self and either advances or diminishes our progress toward God depending on how we live our lives. The soul carries, from life to life, the matrix which defines our body, its health, talents, intelligence, and deficiencies. The essential matter of the soul matrix (the breath-form) transmits the configuration of our physical body to the astral body for manifestation into the elemental nature body. The body of each person is an exact representation of the soul which expresses the attributes, characteristics, strengths, weaknesses, health, temperaments, refinement or lack thereof, level of intelligence, goodness etc. of the individual. It has been emphasized in Stages 1 & 2 that meditation is a bottom up process and the importance of the serenity which has been instilled into the body and the psychology will be evident in Stage 3. In this third stage of meditation, we will develop a more intimate relationship with the soul as breath. This has the potential of being one of the most significant experiences in a person’s spiritual life. When the stillness and wholeness within the psychic waters has been experienced, the new mantra becomes, “Let not your heart be troubled…” A peaceful heart keeps the waters still and one begins to feel different and to see the way ahead. Like the surface of a still pond where the reflection reveals the trees and sky, so the psychic waters “reflect” the level above. When the waters are still, the movement of breath becomes more apparent; in fact, it becomes obvious that the movement of breath is the key to keeping the psychic nature calm. As we take a breath of air into the lungs, the “jet stream” of the psychic breath in the psychic atmosphere will pick up any disturbances and bring them into the “chattering-mind,” which in turn, troubles the waters. These disturbances are the measure of how well we have cleared, purified, and stabilized our psychological (emotional) nature. Don’t try to force anything, just let the stillness happen; but, when it does happen, hold that calm state for as long as possible. Remember, Stages 1 & 2 are building a foundation that must be stable so the subtle Stage 3 experiences can be realized. Once feeling and desire in the cognitive/psychic self are calm and collected in meditation and the breath moves smoothly, the experiences of Stage 3 will become more apparent. For this to be in an understandable context, it is important to know how the Triune Self is integrated and connected to the physical body. The history of humanity can be measured by the evolution of consciousness from the primitive mind to the human “creators” of cutting-edge technology. Human evolution naturally brings to mind the rise and fall of civilizations or the history of warfare, both of which perfectly describe the evolving awareness, proficiency, and innovation of humans. Tragically, there is a parallel between the evolution of warfare and the evolution of consciousness – the more conscious and innovative we become, the more proficient we are at killing one another. However, this perspective of human life and its evolution only denotes the external expression and manifestation of consciousness in this 3rd dimensional reality. The reason so much emphasis is placed on the technological advances of modern civilization is the convenience, comfort, entertainment, and security it creates for the human body. In this world we are fixated on the physical body, but in regard to the evolution of consciousness, this external, materialistic reality is insignificant and temporary. Far more miraculous is the internal reality of consciousness in the human being, and the fact we can control and advance our personal spiritual awareness by simply turning our “outward-looking” focus back onto the different conscious states of the inner self. To begin with, it would not be an exaggeration to say that presently our relationship to our physical body is one of casual maintenance, somewhat like taking care of a pet. Most of our time with the body is spent feeding, cleaning, preening, dressing, using, and resting this physical form; this is what has to be done when occupying a body of nature. However, this hygienic maintenance and adoring love-affair with our physical form fails to recognize the internal reality and spiritual significance of this miraculous system. The hidden potential within the human body is the foundation upon which spiritual realization is founded. Jesus Christ revealed this potential in the numerous miracles he performed and in the resurrection and ascension of his body. He demonstrated these miraculous capabilities for all to see so humanity would have a record of these possibilities. As discussed in Stages 1 & 2, the body of nature is comprised of the four elements of earth, water, air, and fire which correspond to the four vital systems of digestion, circulation, respiration, and generation respectively; each of the four vital systems extend beyond the body as an atmosphere (see diagram below). These systems also correlate respectively with the four senses of smell, taste, hearing, and sight. The fourfold elemental body, the four vital systems, and the four senses are the fixed parts of the body. Whereas, the unfixed, invisible and unmanifested units of nature stream into the body by means of the breath, light, air, water, and food. 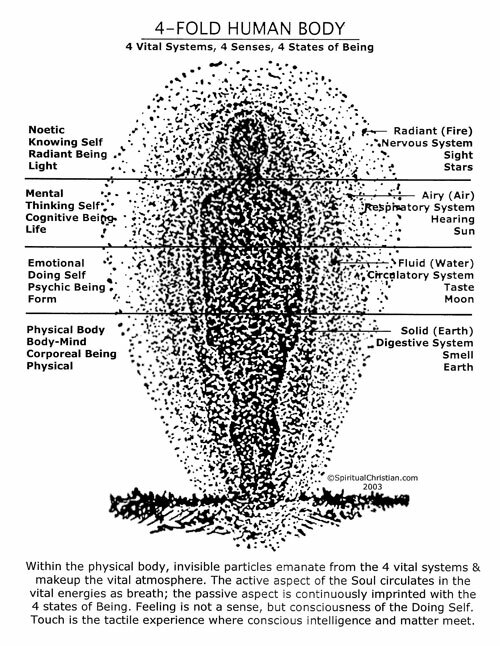 These nature units are moved through the body by breathing which builds out and maintains the form of the body. The breath not only supplies the blood with oxygen, but it pumps all the bodily systems including the digestive system. The physical body does not have consciousness, which means that our higher intelligence does not integrate fully with the body; in fact, it is not connected to the digestive system or the body. At the lowest level, conscious intelligence as feeling and desire integrates with the physical body to become the body-mind. The body-mind is connected to the brain and nervous system, but the body-mind does not think for itself, it only feels sensation. Its primary function is to be the vehicle for the ego-persona and the mind or intellect. Within the psychic nature, the feeling mind merges with the body-mind so it is very difficult to distinguish between the body, sensation, and what we feel psychologically. Although parts of the fourfold nature body are fixed in a given life, the rest of elemental nature continuously streams through all living forms on the planet, as well as the physical universe, to create them, to maintain them, and to terminate them; this can be confirmed in meditation. The physical units of matter which comprise our bodies also flow into the earth and the planets; the water element flows in our circulatory system, in the oceans, and in the moon; units of air flow in the respiratory system and in the sun; and the stars and starlight come from the element of fire, the same light energy that runs through our nervous system. By this miraculous relationship with elemental matter, the seen and unseen components of the human body and its atmospheres integrate with the entire universe, including the distant stars. This is difficult for some people to wrap their minds around, but humans are the highest life-form in the physical universe; it is breathing, self-conscious human beings, on this planet which are the center of the universe. Just as the motion of breathing keeps our bodily systems functioning, it is the collective breathing of humanity which creates the cyclical movements in the natural universe (a good meditation subject). The Creator created the universe in “Its own Image” and we humans are created in the image and likeness of the Creator. Humans are the focal point of that likeness; the universe is simply an extension and an expression of the living symbolism of the embodied human. The visible universe is just the outside of the human nature body whereas our internal self, which is divine, resides in the unseen and extends far beyond the physical universe. 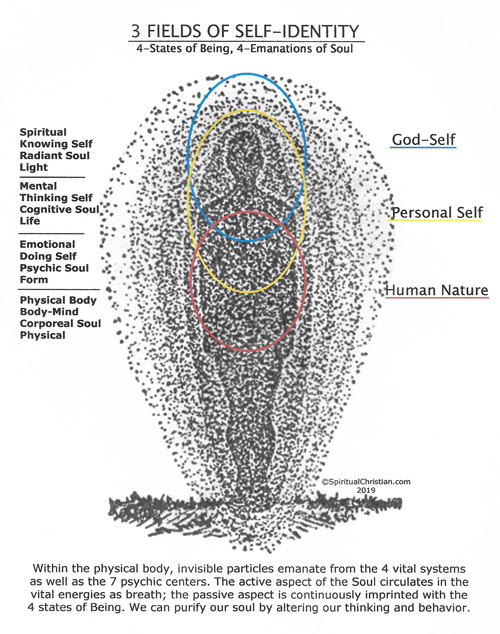 The diagram below shows the Triune Self is not entirely integrated with the physical body. The Doing or experiential self which includes the body-mind is the most integrated part. The feeling-mind of the Doer has its “seat” in the kidneys, and desire operates from the adrenal glands which sit atop the kidneys. In essence, feeling is dispersed throughout the “waters” of the circulatory system and desire is felt along the nerves and in the blood through the hormonal, steroidal, and cortisol secretions from the adrenals. These secretions from the endocrine system stimulate the heart which causes desires that arouse feelings; feeling, desire, and intellect comprise the psychological nature of the Doer. Our thinking self is synonymous with the intuition, insight, and inspiration of the Holy Spirit and is governed by reason and rightness (conscience, correct-discernment). The Thinker has its seat in the heart and a connection in the cerebrum and with the Knower. The Knowing presence of the Father is only connected to the body through the pineal/pituitary gland, but it is this presence which distinguishes humans from all other life forms… we are divine beings, the children of the Creator. Because the Thinker and Knower have such a subtle contact with the body their presence and influence are not apparent; this is the case most especially with the Knower. What this means in terms of the meditation experience is that people must recognize our personal experience with the Holy Trinity is restricted by our attachments to worldly-oriented thinking and perceptions regarding the sensual, material reality of the world. The Divine Presence within a human being is relative to the welcoming receptivity of the individual’s heart. For many religious people, that door may only be open once a week; for secular people it is seldom, if ever, open; and for truly evil people, the divine presence has withdrawn altogether. What the Spiritual Christian is doing through meditation is opening that doorway more and more each day every day until we are in the Presence of the Divine most of our waking hours. In meditation, we are learning about our oneness with the Divine. Just as we have learned that our personal unconscious is like a drop of water in the ocean of the collective unconscious, so our personal triune Self is a point of Light in the Heavenly Light of God. That which is in God is in us, and we can transform the shadows which prevent our union with the Divine Light. It is my belief that the transformation of our individual shadow is one of the highest services we can do in this life for the greater good. When our Doing Self has been prepared like new wine in a new wineskin, we will be filled with the Holy Spirit and receive the intuitive teachings and transformative lessons we need to know our Father in Heaven. In John 14:26, Jesus tells his followers that he must go, but that the Father will send the Holy Spirit to teach us and help us to remember all the things he has taught. In essence, this is what Stage 3 meditation is about, that is, learning how to open up to the intuitive instruction that comes through the Spirit. When the refined and transformed Doing self connects and merges with the Spirit, the connection with the Knowing Self is opened and self-knowledge as intuition is received. At this phase in the advancement of humanity, this is what Christ directed us to do, that is, look to the Holy Spirit for guidance and knowledge. This is how these writings have come about. What makes the life of Jesus Christ so unique and what gave him the miraculous powers to do what he did was that he fully embodied all the potentials of the Triune Self. The diagram below would look very different if it represented Jesus Christ; it would be one complete circle around the body with the pineal/pituitary gland radiating a halo of Holy Light which is why Christ said, “I and my Father are one.” In addition, when he said, “These things I do, so shall you do also and greater than these,” indicates to me that this is the Way of Life to which Jesus Christ was referring. The 3 stages of meditation presented on this site are the means by which Christ’s disciples can begin to embody the Triune Self and follow him. Religious beliefs can only take a person so far. If we are going to follow Christ, as it says in Luke 14:26, we must release all the past issues we have with our family, break our cultural ties, and let go of the attachments we have to the world, even let go of our personal self and follow him. Walking the walk with Jesus Christ is an internal realization to which each disciple must commit. Consciousness as well as matter has an active and passive aspect and it is no different with thinking. Passive thinking is what is referred to as mind-chatter and active intellectual thinking consists of worldly or material thoughts that have emotions attached to them. Thoughts that have emotional interests, specific motives, and living qualities are held in the mind and become living forms which in time will issue forth into the mental realm from the cerebrum, gather substance, and at some point in the future, will manifest as an event or an experience which mirrors that thought. At this present time in humanity, one need only watch the news to see that the thoughts of many people are feeble, deficient, self-centered, and reactionary. Most thinking takes place around the heart and lungs which makes the ebb and flow of breathing even more significant to the meditation process. Obviously, passive thinking disturbs the heart and this in turn, interferes with the breathing which disrupts the bodily functions. Meditation on Stage 2 has been about restricting the passive thinking process by focusing on smooth, connected breathing. The heart is the center from which the elastic ebb and flow of breathing cycles through and around the body and its atmospheres. The heart and lungs are the center of higher thinking; the heart corresponds to the heavenly kingdom (Love) and the lungs to the spiritual kingdom (Knowledge). In other words, the heart corresponds to our volition and affection, an attribute of love, and the breathing of the lungs corresponds to reasoning and intuition. The deepest communication of our spirit is with our breath and heartbeat in this stage of meditation – the stage is set by the presence of love and affection from the heart, and thoughts are focused by smooth, quiet breathing. These two motions of the lungs and the systolic motion of the heart determine the receptivity and quality of thought, inspiration and insight in meditation. When our heart is filled with the Christ Light, the volition of the heart or our intent produces love and goodness; likewise, when our reasoning is guided by the Spirit, it produces faith and truth. Stage 3 meditation becomes possible when the psychic nature is no longer struggling with the dualities of life and self, but knows wholeness. When the breathing is smooth and the thinking has subsided, the waters of the psychic nature are peaceful, clear and still – only then is it possible to experience “thought without thinking.” This is the beginning of the heart and the head coming together, that is “teaching your heart to think and your mind to feel;” this is a state of Beingness which resides between the head and heart. The meditation experience in the Thinking Self is our personal experience of the Holy Spirit as intuition, inspiration, guidance, love, and the knowing of I AM. This is the experience Christ pointed us to in John 14:26. This is the closest contact we have to Christ and to the Spirit within ourselves. The Father as the Knower is a quiet, but elusive presence that enfolds each of us with unconditional love. Active meditation is equally as important as quiet sitting meditation. What this means is that one is conscious of the Spirit and can BE in the present moment in the Spirit through daily activities without disturbances from the chattering-mind or the emotions (See: Walking Meditation). To me, this is the living symbolism of walking on the waters. It is very difficult to do this because so many things in the outside world disturb our tranquility. Practicing being in the present moment with the Spirit will reveal our undeveloped states, such as: a lack of faith in the Spirit when we feel fear, uncertainty or insecurity; a lack of resolve and commitment when we find ourselves distracted by temptations which cast doubt on our true priorities; feeling disappointment because we have projected expectations into an event, experience or person; or having the ego trying to take control of the present moment because we are not being selfless. To truly come into the Spirit, one must “die” to the personal self and become selfless like Jesus Christ. If we are truly the disciples of Jesus Christ we must always be selfless (clear of ego influences) to walk in the Light and in the Spirit. In this stage of meditation let go of the awareness of the personal self and the passage of time. There are a few techniques in higher consciousness that are useful when the attention is controlled: 1 - the first lesson is to learn how to focus the mind on a specific topic and hold that topic in consciousness allowing for the light to be drawn into the subject of the thinking. Keep the subject in focus at the point between the eyebrows until the subject clarifies itself. Hold the subject in the light until it is illuminated and known or experienced; 2 - apply focused thinking to learn how to feel feeling. The feeling mind can be felt separately from bodily sensation and emotions; 3 – and focus on the breath moving through the different levels and atmospheres of the body. Become more and more aware of the breath-form. ~ Step 2: Be connected to the movement of breath and do not let anything interfere or interrupt this bond. Breath from the lower abdomen upward to the center of the head then let it return and repeat. Breathe smooth, rhythmic, slow and long breaths; be aware of the movement of breath on each level. This will create a serene state of mind to connect with Divine Presence and receive real insight. Eventually, steps 1 and 2 will merge so you will be focused at the point between the eyes and connected to the movement of the breath simultaneously. Gradually, let the awareness of the breathing fade into the background. How focused and serene you are while practicing this technique will determine the results you attain. Always be receptive to intuitive guidance and learning; each person will develop an individual relationship with the Spirit and will receive revelation unique to one’s True Self and life experiences. Successful meditation practice, over time, will change and reorder the nature units which comprise the physical body as well as the psychic nature making them conform to the new reality of the spiritual Self. Be still and know God. Into which I dove down willingly and began swimming as quickly as I could to the light. But I soon found myself passing through the deep place where all my real shadows hide. And I had no other way to go but onward; and I was kicking as the walls closed in. As stroke after stroke, I drove through the darkness, guided by the fire of a distant star. I rejoice to breathe in eternity, reflecting so clearly in the light of love. The terminology of the Triune Self, the 4-fold body and the breath-form are taken from the book Thinking and Destiny by Harold W. Percival. Basic terminology regarding the instinctual body, the shadow and the psychic nature come from Analytical Psychology and the writings of Carl Jung. The application of these terms to the different stages of meditation is based on my own meditation experiences.